Having a well optimised Google business page with positive reviews is a vital part in ranking well in your local SEO market. But what if you are a business with more than one location? What is the best practice for setting up and managing multiple location listings? Each location needs to have it’s own individual Google Business page. They can be bulk uploaded or uploaded individually. It is generally advisable to upload them all under the same Google account login. The name of your Company/Organisation should be the actual name of your business – no need to include the location in this field. The image below shows what I would fill out for my Unley restaurant. If you have too many locations to upload manually, you can use the bulk upload function within Google Places to set up all your business locations. This works well for a restaurant chain, franchises or hotels with more than 10 different locations. I have covered this is in my Google places post a couple of months ago but make sure you fill out as many details on the Google Places page as possible and achieve a 100% completion on each Google Places page. The most effective way to manage multiple locations on your own website is to have a specific directory dedicated to a locator section illustrating the physical locations of your company. This locator page would contain links to the specific subpages for each location along with a brief description of each location. Within the Google Places “website” area, instead of just putting in the main domain name of your website like www.seomaverick.com.au, fill in the specific sub-page for each location. So for the Unley location in my example, I would put www.seomaverick.com.au/offices/unley in the website section. The next and most important part of these specific location pages is having relevant information which corresponds to the information on the Google Places page. 1. Name, address and phone number (NAP) in the page title. 2. A paragraph about that restaurant in that location using relevant copywriting including keywords. The key here is to make it useful for visitors who click through from the Google Places page to your specific landing page. You want them to find out more information about that particular location including directions, images, relevant content and even reviews. They are clicking through to your website to get more information, so give it to them! I came across the Geositemap Generator tool recently and is extremely useful in giving Google a more accurate understanding of your business locations. It’s really easy to use, and once you have followed all the steps on the website you need to upload the geositemap.xml into your Google Webmaster Tools account. Another very important part to your Google Places listing is the number, quality and star rating of the reviews left on your Google Places page. As a general rule, the more positive reviews you have on your listing, the higher you will rank for local search terms. Don’t be afraid to ask loyal customers to leave a review on your Google Places page (they will need a Google account to do this). 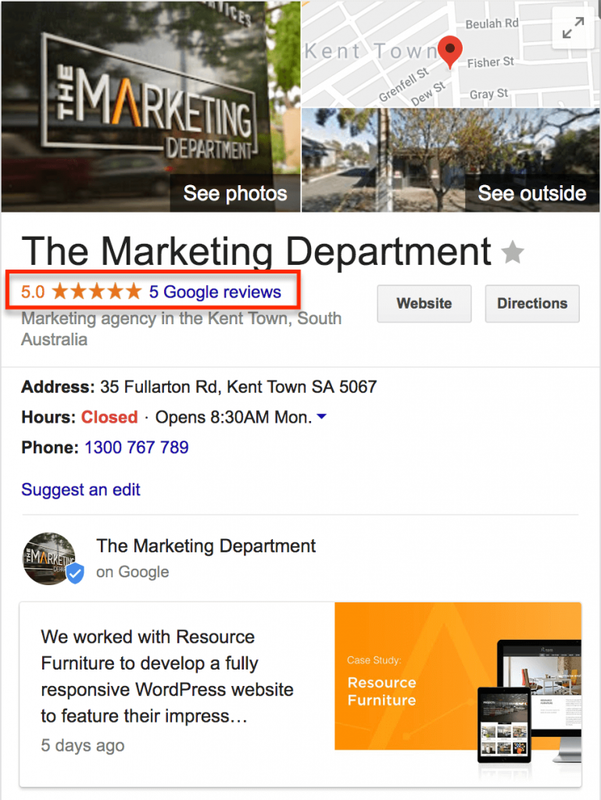 I’m sure you could think of a number of ways to get more reviews on your Google Places listing – but be careful, false reviews and spammed pages can be penalised and you will lose all of your rankings and traffic! Having consistent business information for each of your locations across all local citation websites is very important. This refers primarily to your business name, address and phone number. These details need to be consistent across all mentions of your business throughout local websites that Google using to confirm information about businesses. Take a look at your competitors Google Places sites to discover the websites Google uses to determine name, address and phone consistency in your local area. Then create your own listing on these directories and make sure they correspond to exactly what you have on your website. Google is looking for consistency of name, address and phone number! This guide should help you to develop you own logical strategy to get each of your business locations to rank well in Google for your relevant local searches. Another excellent topic – a wealth of information provided in simple layman terms. Thanks! Thank you for putting this post together. This is by far the most detailed guide to uploading multiple locations into Google Places the right way I’ve managed to find and I’ll definitely be using it as a checklist in the future. Thanks Kevin, let me know if you do add multiple Places pages for an individual business. I have trialled this with a couple of different sites and have had varied results particularly with using the homepage as the destination URL vs having a custom location page URL. I find that if you build up the custom location page with good local content and a few deep links pointing to it, it can be very effective. Thanks for the insights! We’re about to expand to a second location and I definitely want to ensure the best SEO results. Thanks for the detailed information. I still have another question though. I work for an organisation that manages nature parks: http://www.natuurmonumenten.nl/content/355-afwisselende-natuurgebieden We have 355 parks in the Netherlands. These parks have no exact postal code. Google does not accept a bulk upload without postal codes. We do have the exact geogrphical location. How can i upload these? Great Article Andrew. Any tips on finding Citations for your Google Places listings? Google looks like they have hidden this information now. In the US there are a number of citation websites that Google Places uses to cross reference to determine the relevance/location of each business. This page here provides a great list of all the citation websites that are used in the US: http://searchnewscentral.com/20111026198/General-SEO/the-ultimate-list-of-local-citation-sites.html – also available in an excel spreadsheet. Good article…. will subscribe to your newsletter cheers. Thanks Mitch! Look forward to having you on board. Revisiting your website, just wanted to know with the recent changes to google places listing. Is it still possible to have suite numbers in the address eg second line of address field to contact suite number ? Also what about having a 1300 number on multiple listings as the main number because its the main toll free number do you think it will trigger a ban for this ? What’s your experience. thanks for the info.i was looking for information like this.we have 10 hair salon and was not sure how to create google places for each one.i was affraid that we are not allowed to do that even though 10 salons have different phone numbers/locations but one webpage with different page for each location. Hi Aghper, yes you are correct, you only need one Google account to set up these 10 different hair salons. You can add all the different locations from within the one account and there is actually a “bulk upload” feature in Google places that allows you to import multiple locations all at the same time (10 or more at once I think). You will still need to verify them each individually and you will receive a postcard containing the verification PIN at each location. Hi! This is great information and I plan to use it for one of our clients who has multiple locations but same company name. Creating a folder called “locations” and designing different landing pages for each location are great ideas. This article is so helpful! I have a quick question, would it harm or hinder local search capability if I were to list “two addresses” together on each page of the website (at the VERY top, part of the banner). My strategy is to list the “prominent” address on each page of the website, and then focus landing pages to each location. My client prefers I list both address on each page. I feel this may hurt rankings. From what I’ve learned, its possible for Google to just ‘ignore’ sites like this that don’t make sense. Hey mate, really good article and breakdown – one question that I’ve got which is a little obscure: I’ve expanded my company’s operations to canberra where we don’t have a physical address – our physical address is in Brisbane – I’ve set up our Google Places listing for Canberra using the Brisbane address whilst setting the service area to 18km around Canberra (we service customers at their location), is this a sound method for setting up places in different cities? Are we better off ditching local SEO entirely given we can’t really build citations that are Canberra specific in terms of the address? Hi, we are opening a 2nd location for our business but we are using a different name for other reasons. We will like to show same database content and pictures that are currently being displayed in our original website but we are worried about affecting our current web ranking. We will be setting up a second account for google places for new location, new phone number, new address. What should we do? We are considering building a new site, new blog section, new image gallery with altered image descriptions but sharing the dynamic content (items for sale). Wondering if this is the right way to go about it. What about a service business that serves multiple locations but doesn’t have an actual address for them? For example my company has 20 locations across the country but its a client in-home service that my contractors perform. Do I have any chance with google places in this situation? Thanks for your question Jason! A business owner may add service areas to a new or existing listing if his business model requires him or an authorized representative of his business to travel to his customer’s location. Some examples include: a restaurant that offers delivery to your door, a dog-walking business that picks up your pet from your home, or an in-home maid service. So the question for you is whether you want to create just one local listing and select the right service areas (all your locations) in there or whether you want to create individual listings using an address in each location and hide those addresses (the 2nd option is probably not advisable). Hi Andrew, great post. Would you recommend creating unique location pages for areas serviced even if the client doesn’t have addresses in these areas? Hi Kerry, great question. It really depends on how large and easily differentiated these locations are, and to what extent you are servicing in those areas. I wouldn’t recommend creating ‘cookie cutter’ pages with the same content and with only a few changes in the location keywords for every location – this could lead to a duplicate content penalty. I would recommend only creating location pages if you can provide unique information about your services in that area and how they differ from other the other areas you serve. This could include how long you’ve been operating in that area, how you serve customers in that region and anything else that might be relevant to that particular area. I would also try and include surrounding areas, keywords, locations and regions within an individual location page – try and group them together where it makes sense. Really nice post… actually i am searching for that can we use a single phone number for two different business(address also same)? Hi, We are national plumbing company and we have multiple franchisees in Melbourne. We are providing plumbing services to customer’s house 24/7. We have added individual franchisees address into google my business for particular service area. But yesterday google suspended our all google+ pages in our account. We have customer’s review as well in our goolge+ pages. I called google support and they told me that we can’t add multiple franchisees address in google my business for service business. You mentioned that google allow multiple addresses as franchisee business. So I am confused here, can you please help me to understand this situation. one question, When i list a new listing and do not mention the city at the company name field, Will google show it name after the company name? like showing in the first picture you showed?